Cue the highlighter and notebook paper—it's time to get my study on! 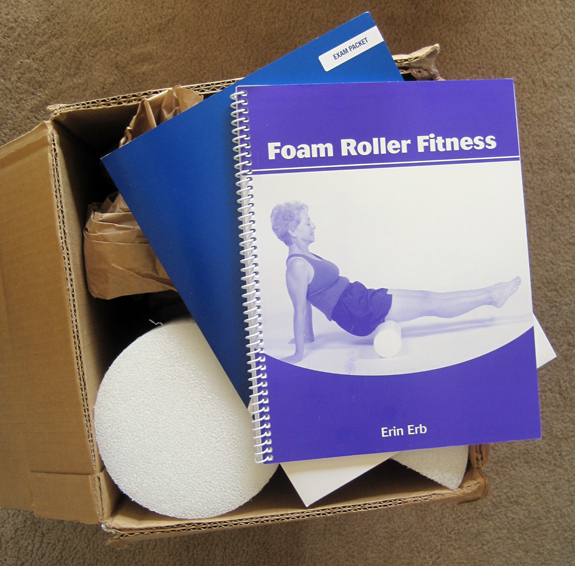 A few weeks ago, I ordered up a Foam Roller Fitness continuing education course from DSWFitness. It has arrived! 2) Why didn't I ever get this excited about studying when I was in school? I mean, don't get me wrong, I always enjoyed learning. But the process of sitting down and studying something, memorizing something so that I could recall it (or use it) at a later date? Drag. Maybe it's because I literally HAD to, where as now I am CHOOSING to. I don't know. Know what I mean? Back to my foam rollers. I now have five of them! And I have no clue how to use them. We have one at the gym and I've been playing with it. Basic IT band rolling, really. Who knows if I'm doing it right. Ironically enough, we just got another roller. It's shorter, which baffles me. There's one in the box above, too. No clue what to do with it! There are also half rollers in the box that supposedly help one acquire better balance. This is also ironic because a very new clients of mine has expressed an interest in improving their balance. Here's to hopin' I can help him out on that one. Time to study. You can order up a copy of this book for free (yes, no charge) from our government's Office of Research on Women's Health. Did I mention it was free? It clocks in at 177 pages that cover topics like Breast Cancer, Eating Disorders, Menopause and TMJ. It's a fun little resource, I think. Not anything deep or intimidating, but a useful resource nonetheless. And, once again, it's free. FA-REE. Order up! Question: Have you ever used a half foam roller? You know, the kind with a flat bottom? What have you done with it? And just for kicks, what kind of student were (are) you? My roller is short. I don't think I'd want to use a long one for my IT band. Long ones are good for your back, though.